The Fiji food scene is continually evolving for the better. While there is plenty of star power amongst international chefs at the helm of award winning restaurants, there are also many talented local chefs and cooks carving their way up to the top. Meet just a few of them here and read about their professional life, personal insights and take a few cooking tips from our brief Q & A list below. 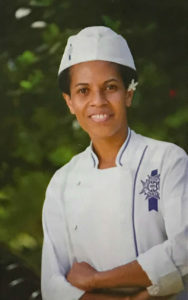 Executive Chef at Raymond’s Restaurant at the Fiji Orchid Resort, Lautoka. Raymond’s Restaurant at the Fiji Orchid is famous for its delicious contemporary Fijian cooking style. Executive Chef Sewale professionally trained at the Le Cordon Bleu cooking school and has long mastered the art of seamlessly merging international and Pacific Rim cuisine. Sewale has created a wonderful menu that features a majority of traditional South Pacific recipes which use Fiji’s fresh local produce and both traditional and exotic herbs and spices. Sewale’s Signature Dish: Toa Vakasoso – Chicken Breast Fillet with Pawpaw Rolled in Coconut & Served with mango Sauce. Q. What are the best local Fijian ingredients? A. It has to be coconut and all of our fresh seafood. Q. Your favourite meal as a child? Q. What are your hobbies outside of the kitchen? Q. Name a Chef that inspires you? A. Robert Oliver – Ambassador for Le Cordon Bleu, New Zealand and the Pacific Islands. Author of Me’a Kai: The Food and Flavours of the South Pacific. A. I adore all French Cuisine, particularly a dish of Chicken with Mushroom and Tarragon Sauce. Q. Best advice for aspiring chefs? A. Whatever you do, do with determination and courage and be passionate about your work. Thank you to Fiji Airways for the feature.